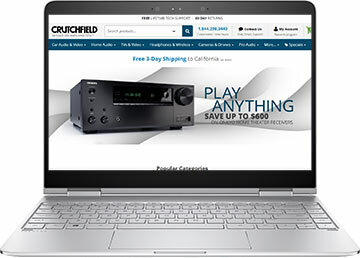 We list Crutchfield coupon codes, discount promotions, and sales offers on this page to help you save on car audio, home electronics, cameras, televisions, and other consumer electronics products. Started in a family garage in 1974, Crutchfield was the first web retailer to sell consumer electronics when it launched Crutchfield.com in 1995. These days it remains a popular shopping destinations for car audio, televisions, headphones, home audio, wireless speakers, fitness trackers, digital cameras, action cams, drones, video projectors, pro audio gear, and other electronics products.